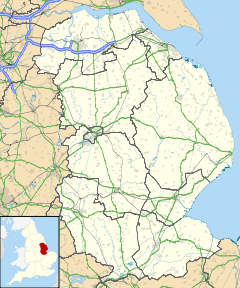 Kirkby on Bain is a village and civil parish in the East Lindsey district of Lincolnshire, England. It lies on the River Bain between Horncastle and Coningsby, and just west of the A153 road. Close to the north is the village of Haltham. Formerly known as Kirkby Super Bain, the name comes from the Old Norse kîrkĵu + býr (Church settlement), with the village dating back to at least the Viking Age. The village public house is the Ebrington Arms on Main Street which dates back to at least the 16th Century. It was popular with airmen from the nearby RAF Woodhall Spa famed for its links with the 617 Squadron Dambusters. The parish church is dedicated to St Mary, and is in the Bain Valley Group of churches. It dates back to Norman times, and the parish records to 1562. The church was largely rebuilt in 1802 and expanded in 1879-82. Kirkby on Bain lies within the glacial Bain Valley at the confluence of River Bain and Haltham Beck. The Bain was canalised into the Horncastle Canal in the 1790s with the Old Course now little more than a stream in many places and dry in others. To the north stretches the shallow glacial valley of the River Bain. Along the valley floor and flood plain the land is largely pastoral farmland used for rearing cattle and sheep, whilst further away from the river the land is more arable. To the south along the valley are sand and gravel pits, many of them now long disused and some transformed into Kirkby Gravel Pits Nature Reserve. To the west are Kirkby and Roughton Moors; a landscape once dominated by Lowland Heath now restricted to Fox Hill, and beyond is Ostler's Plantation, a pine woodland owned by the Forestry Commission. In this landscape can be found Kirkby Moor and Moor Farm Nature Reserves, both SSSIs, and soon to be joined by the former airfield of RAF Woodhall Spa purchased by the Lincolnshire Wildlife Trust in September 2014. ^ English, University of Nottingham - Institute of Name Studies School of. "Key to English Place-names". kepn.nottingham.ac.uk. Retrieved 2016-09-20. ^ "About The Ebrington Arms, Kirkby-on-Bain, Lincolnshire". Retrieved 2016-09-20. ^ "About". 2015-09-07. Retrieved 2016-09-20. ^ "St Marys, Kirkby On Bain". British Listed Buildings. English Heritage. Retrieved 7 July 2011. ^ "Lincolnshire Wildlife Trust completes purchase of Woodhall Spa Airfield | Lincolnshire Wildlife Trust". www.lincstrust.org.uk. Retrieved 2016-09-20. This page was last edited on 7 April 2019, at 09:56 (UTC).